We started homeschooling last week – a little earlier than we had planned to, but some of the children were very eager to begin and there was really no reason to put it off. While Matt was excited about homeschooling, I admit I was initially a little bit less than enthusiastic at the idea of adding this responsibility to our already full schedules. Having our children at Mars Hill Academy while Matt was teaching there made it possible for me to train as a midwife and then build a busy midwifery practice. Over the years, I became accustomed to having most of the family leave for school in the morning which gave me plenty of uninterrupted time for my own work. I was not very excited about having to devote a significant part of my day to the sometimes tedious work of teaching my younger children to read and write! I might not have been exited about it, but I knew homeschooling was really the only option that made sense right now. We are not sure of our exact departure date for the Philippines, because of the uncertain timing of raising missionary support, but it is likely to be midway through the school year. We will probably be doing quite a bit of traveling for church visits this fall. Because Matt is no longer a Mars Hill teacher we would not be able to afford tuition for all our children even if we wanted to put them back in the school for whatever part of the school year we’ll actually be here for. When we do arrive in Davao, we would have to either switch to homeschooling or put the children in a new school mid-year. And finally, we don’t know yet how long we’ll be in Davao — it’s possible we’ll be there for many years, but it’s also possible we will spend just a year there while I learn from the directors of the birth clinic and then move on to another assignment in another location. 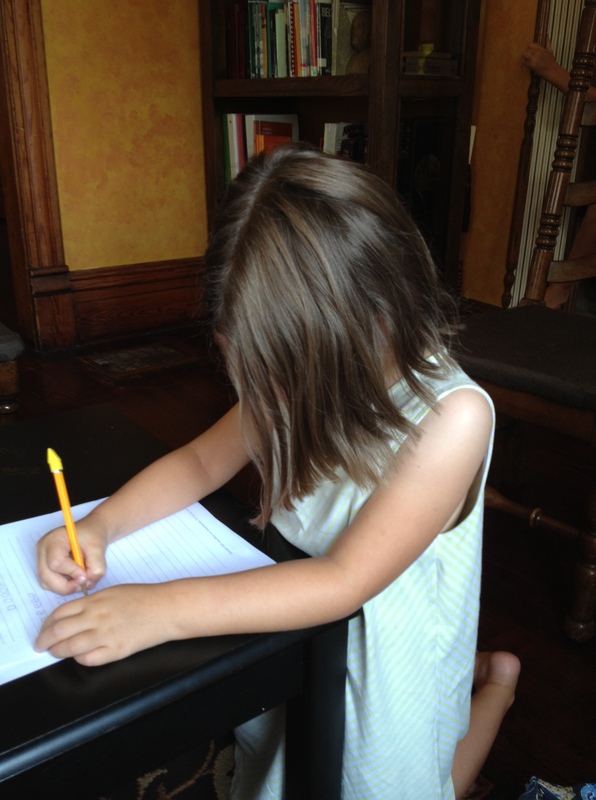 Homeschooling will give the children some continuity during this time of transitions. Well, we’re two weeks in and it really could not be going better! Matt and I are sharing the teaching and are enjoying being able to choose how our children’s minds will be filled. We do some things together with all the kids (including memory work and morning prayer) and then Matt does one-on-one work with the older two while I teach the younger ones. The children are thriving on the new routine and I have to admit I am loving the dedicated time with them. A bonus is that Hosanna – who would not have been able to start kindergarten this fall because her fifth birthday is not until November – gets to “do school” with her older siblings and she is thrilled.